It’s all go, go, go at Clearleft while we’re working on a new version of our website …accompanied by a brand new identity. It’s an exciting time in the studio, tinged with the slight stress that comes with any kind of unveiling like this. I think it’s good to remember that this is the web. I keep telling myself that we’re not unveiling something carved in stone. Even after the launch we can keep making the site better. In fact, if we wait until everything is perfect before we launch, we’ll probably never launch at all. On the other hand, you only get one chance to make a first impression, right? So it’s got to be good …but it doesn’t have to be done. A website is never done. I’ve got to get comfortable with that. There’s lots of things that I’d like to be done in time for launch, but realistically it’s fine if those things are completed in the subsequent days or weeks. Adding a service worker and making a nice offline experience? I really want to do that …but it can wait. What about other performance tweaks? Yes, we’ll to try have every asset—images, fonts—optimised …but maybe not from day one. Making sure that each page has good metadata—Open Graph? Twitter Cards? Microformats? Maybe even AMP? Sure …but not just yet. Having gorgeous animations? Again, I really want to have them but as Val rightly points out, animations are an enhancement—a really, really great enhancement. If anything, putting the site live before doing all these things acts as an incentive to make sure they get done. So when you see the new site, if you view source or run it through Web Page Test and spot areas for improvement, rest assured we’re on it. 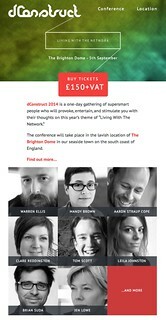 dConstruct 2014 has a new website. Huzzah! When I announced the original website two months ago, I was very, very excited about the line-up, but I was less excited about the design of the site itself. To be honest, it was a somewhat rushed affair. It did the job but it didn’t have much pizzazz. I had some design direction—colour, typography, texture—courtesty of Mikey, but I didn’t push it to do anything very interesting. 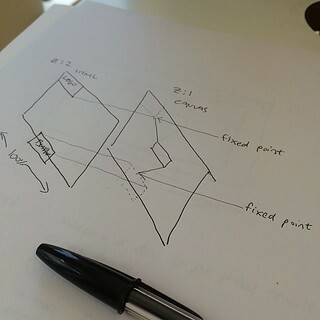 So Mikey took some time to iterate and revise, and he came up with a gorgeous new design. I think this does a much better job of capturing the spirit of dConstruct. As well as a revised colour palette and lusher textures, there was also opportunity to do something quite playful in the masthead. Making sites for our own projects always presents a nice opportunity to try out some whacky stuff that we might not get a chance to do on client work. 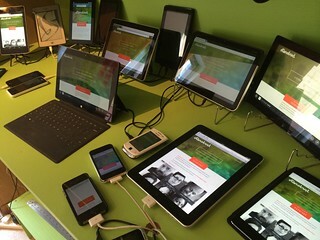 In this case, the plan was to play with the theme of this year’s dConstruct—Living With The Network—and use it as part of the visual design, literally networking up parts of the interface. It was a nice chance for me to play around with canvas. But I didn’t dive into code straight away. I had a think about how I could add this an enhancement to the responsive layout. My plan was to generate a canvas element under the existing elements in the header using z-index to keep them separated while maintaining the appearance of having everything connected up. It worked out pretty well. But I wanted to push it further. 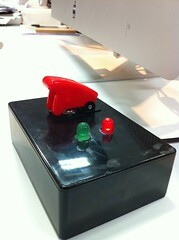 How about making it an interactive element that responds to the user? I know, I know. It’s very silly and frankly a bit wanky, but y’know, it felt like it would be nice and playful. I had no idea how to do it though. 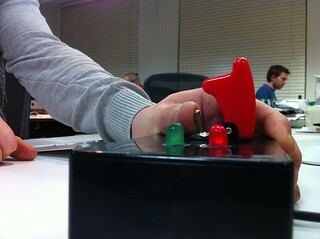 At an internal code review here at Clearleft, I demoed what I had so far and asked for advice. The general consensus was that I should probably be using SVG rather than canvas for making interactive graphical elements. They’re probably right, but I distinctly remember learning about hit detection and mouse events in canvas during Seb’s excellent Creative JS workshop. So I stuck with canvas and fiddled around with numbers until I got to something that felt lke it reacted nicely to hover events (or touch/clicks if hover isn’t available …or even if it is). requestAnimationFrame was a godsend when it came to getting smooth animations. Have a play with it. It’s hard to miss. It’s not exactly a subtle easter egg. The content of the site remains much the same. 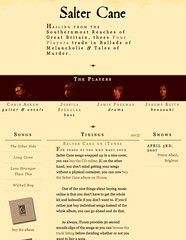 While I was disatisfied with the original visual design of the site, I’m still pretty chuffed with the copy. One small change I made was to give the code of conduct its own page (and expand on it a bit). Previously it was included with terms and conditions but there was a good chance that it could’ve been overlooked there. Anyway, I hope you like the new site. I think Mikey did a terrific job with the design and it was a lot of fun to put together …especially the silly wanky bit. The only slight disadvantage is that the page weight comes in slightly larger than the previous design. But I’ll keep optimising to see if I can shave off some bytes here and there. Oh, and you might notice one significant change on the home page. In addition to the speakers that are currently listed, there’s an addendum that reads “…and more”. 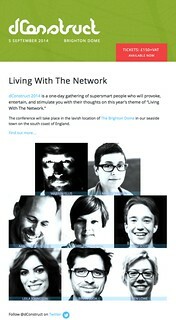 That’s because the line-up for this year’s dConstruct, awesome as it is, is not yet complete. It’s going to get even better. 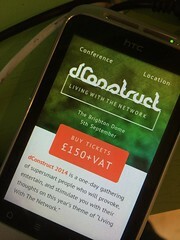 If you don’t have your ticket to this year’s dConstruct yet, what are you waiting for? See you on September 5th. We finally launched the long-overdue redesign of the Clearleft website last week. We launched it late on Friday afternoon, because, hey! that’s not a stupid time to push something live or anything. The actual moment of launch was initiated by Josh who had hacked together a physical launch button containing a teensy USB development board. 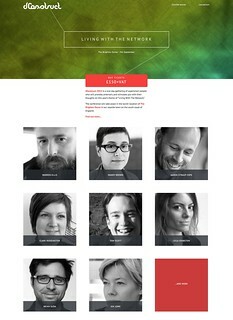 Keep the feedback and comments about the new @clearleft site coming. Launching a site is just the start; much to iterate upon and improve. But it’s nice to finally have something new up. We were all getting quite embarrassed by the old site. Version 1 launched in 2005. I wrote about it back then. It looked very much of its time. This was before responsive design, but it was, of course, nice and liquid. Version 2 came a few years later. There were some little bits I liked it about it but it always felt a bit “off”. Version 3 was more of a re-alignment than a full-blown redesign: an attempt to fix some of the things that felt “off” about the previous version. Version 4 is where we are now. We don’t love it, but we don’t hate it either. Considering how long it took to finally get this one done, we should probably start planning the next iteration now. I’m glad that we’ve kept the archived versions online. I quite enjoy seeing the progression of the visual design and the technologies used under the hood.